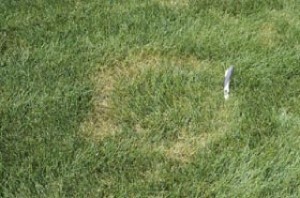 Necrotic Ring Spot (NRS) Archives - JVJ Lawncare & Sprinkler Co. | JVJ Lawncare & Sprinkler Co.
Necrotic ring spot symptoms may initially develop as light green to straw-colored rings or frog eyes in lawn. Photo from CSU Website. 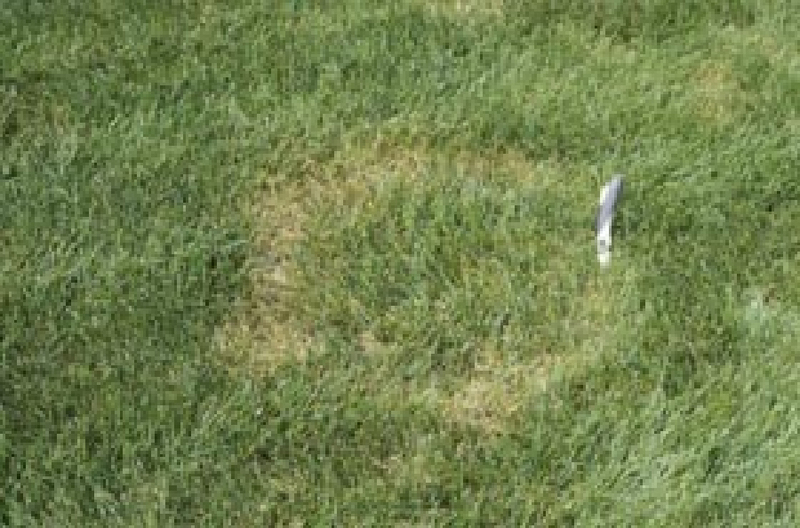 Necrotic ring spot is caused by a fungus & is a perennial disease of Kentucky bluegrass. It is considered one of the most common diseases of turf along the front range & the most destructive. Symptoms often develop in late summer. NRS results in irregular circular shapes or Patches sometimes referred to as “frogeye”. Shapes can range from several inches to several feet in size. They can be localized or widely scattered throughout the yard. NRS is one of the most widely studied turf diseases however it is the least understood. NRS may reappear and intensify in mid-summer in successive years and may take several years to control. Treat with a fungicide. Apply application when fungus is active in spring and in fall. Apply a second application about 2 – 4 weeks after first one. A third application may be necessary on severely damaged lawns. Lightly water the fungicide into the turf (less than ¼ inch) but do not drench the lawn. Fungicide applications only suppress NRS; they do not eradicate the NRS fungus. Therefore applications over several years may be necessary to manage NRS on severely damaged lawns. Where to get fungicide. While these products are not restricted use they for the most part are not are not packaged for sale at retail outlets. Therefore, these fungicides are usually applied by professional lawn care operators. Call us for a free Quote! Applications usually start around $55 and go higher for more severely damaged lawns. Prepare soil properly before sodding or seeding. Over seed diseased patches with resistant grasses. Do not overwater. Water turf deeper & less often, usually no more than 2 – 3 times a week, without creating water stress. Keep a good turf height. Mow lawn at a height of 2 ½ to 3 inches. Remove no more than 1/3rd of the blade at any one mowing. Mulching may actually help turf recovery by recycling nitrogen during the leaf decomposition process. Core aerate established lawns at least once a year (spring or fall) to help reduce thatch buildup and improve soil drainage. Core aeration equipment may spread the NRS fungus although this is not likely a major means of pathogen movement. Furthermore, the benefits of aeration outweigh potential problems. Avoid applying excessive amounts of nitrogen fertilizer.Applications of more than 4 lb total nitrogen per 1000 square feet per year may enhance NRS. Timing of fertilizer applications is as important as the total amount applied.